Several hundred members of Sydney's legal community attended the 78th annual Red Mass, led by Wollongong bishop Peter Ingham. 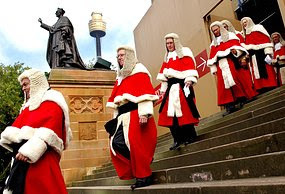 Supreme Court justices and judges and magistrates from the district and local courts wore traditional robes as they led Tuesday morning's procession into St Mary's Cathedral in central Sydney. Judges attend the Mass, which signifies the commencement of the law term, to seek divine guidence in the legal profession.